The view of the eclipsed Sun with the two planets over the water was outstanding and a complete justification for the choice of viewing location. Our journey began with a London tube train to the airport. It ended in Russia with the famed Moscow metro taking us to our accommodation. In Moscow, we explored Red Square with its dazzling Church of St Basil and the huge prison-like department store called GUM. We went inside the Kremlin and visited The Armoury. This badly named museum contains a few weapons but it is famous for the gold, silver and jewels collected by Russia's tzars and tzarinas over the centuries. There was a large collection of Faberge eggs and carriages including the one used by the unlucky Nicholas II. Novodevichy Monastery was a working convent with a quiet ambiance away from the noise and hustle of the city. The city's Metro was very attractive - the stations are made from marble with chandeliers, stained glass, mosaics and elaborate carvings. It has a slightly faded 1930s feel. The Trans-Siberian Railway. Two days of train travel. Outside the views were of trees - and more trees. And clouds and rain. And rivers crossed on big noisy metal bridges. Did I say rain? There was an eclipse to come - I didn't want to see rain. Finally we arrived in Novosibirsk. Here we met two people (Mari von Hoffmann and Bonnie Leifer) who had been with us at the 2006 eclipse in Turkey. Bonnie's husband, the easy-going Tim, had been persuaded to join our group. Many eclipse chasers were gathered around a statue of Lenin. Some talked of hiring a bus so they could outrun any clouds. The favoured site was the northern shore of the nearby Ob Sea. The northern shore of this large body of water, thirty kilometers south of Novosibirsk, was supposed to have the better weather prospects. I favoured the southern shore. I wanted to see the approach of the Moon's shadow over water and I liked the idea of the eclipsed Sun being visible over the sea. We had spent a day locating an eclipse site to which we could commute by local train and bus for less than $2. It took us till 3am to prepare all our equipment and our day pack with refreshments so I was a little tired when the alarm went off at 8am. It was good that this eclipse would be the latest that I had seen (17:45 local time). For once we could take it slowly. The weather was predicted to be "patchy". Outside there was sun and there were clouds. They were cummulus clouds and I guessed that they would build up around the middle of the day then fade as it got later. This was the first eclipse that I would commute to. Our journey began at 9:15 with the number 13 trollybus taking us to the nearest metro station. A single stop ride took us to the Novosibirsk railway station, the largest on the Trans-Siberian Railway. We chose the smaller entrance for local trains and bought our tickets. We were joined by seven others making a total of nine. Apart from ourselves (Kryss and Talaat), and our three USA companions (Mari, Bonnie and Tim) we were joined by Olga (an Austrian who spoke Russian) and three Greeks: Georgina, Yiannis and Yianna. At 11:06, with combined Russian and eclipse timing, the train departed from platform 11A with the nine of us looking forward to a day on the beach. It took a little over an hour to arrive at the city of Berdsk. The number 3 minibus was not at the station but a driver of an empty number 12 took all of us for the same price. 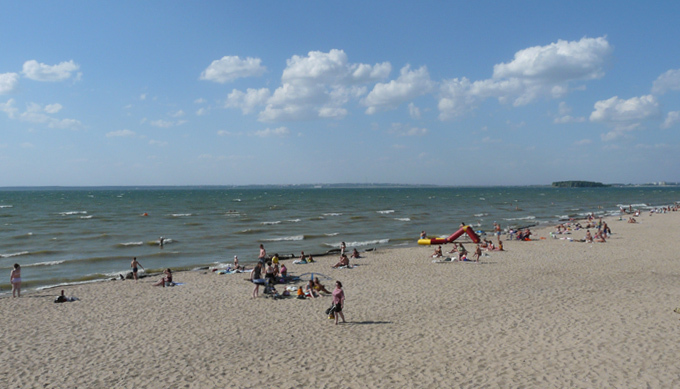 At 12:30 we arrived at our eclipse site, Staribirsk Beach on the shore of the Ob Sea, one of the largest bodies of water in Siberia. The eclipse would not start for over four hours. Staribirsk was a 50m wide Russian beach, several hundred metres long. The place had a shop, shade and a flat wooden stage-like structure that we climbed onto overlooking the sand, sea and bathers. We were the only foreigners there and nobody disturbed us. Behind us were trees and people camping. The sea was West and North, the direction of the shadow approach and the location of the Sun in late afternoon. The 'stage' structure that was our observation place. We passed the time swimming, shopping for watermelon, drinking tea, nibbling snacks, looking at the clouds, jotting notes in diaries, preparing cameras, lying in the sun, reading, retrieving hats blown away by the wind, or just waiting. 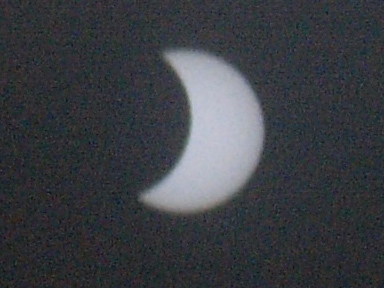 As eclipse time approached the wind became stronger but the clouds mostly disappeared. It was hot. First Contact was at 16:42 with the Sun behind the only cloud in the sky - it was a small one so we saw the bite soon after. The partial phase of this eclipse lasted only an hour, far shorter than previous eclipses. They seemed to pass quickly too. The sky colour began changing after only about ten minutes. To the South it became a dull blue colour as if it had lost the bright blue sparkle of daylight. The golden light of evening was made more so as more and more of the Sun disappeared behind the Moon. Dogs were barking in the distance. The sea changed colour constantly as the light changed. The bright reflection of sunlight on the water became muted. There were no clouds anywhere near us - only a few small ones hugging the horizon. Birds appeared to be flying around confused. By 17:40, the light had dimmed dramatically and everyone was excited. 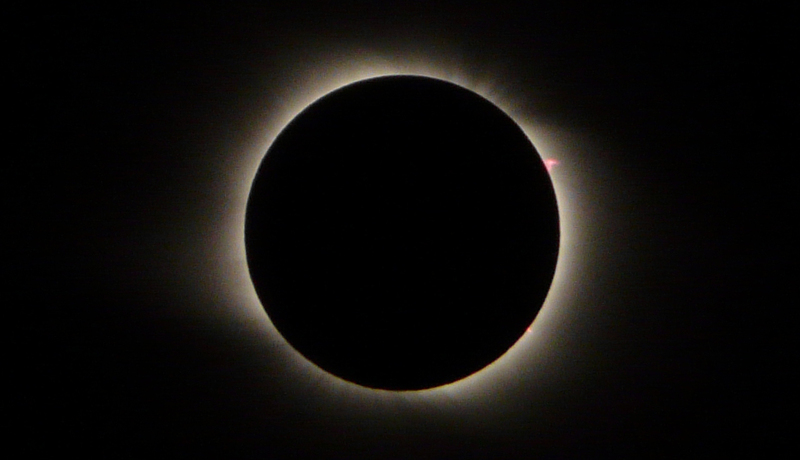 This was a very fast eclipse and things happend quickly around the time of totality. Bonnie spotted Venus about two minutes before totality. I didn't see it. I was watching the shadow approaching. The clouds on the horizon turned dark. The sky beyond turned almost black. The horizon reddened. All too quickly Totality was upon us. 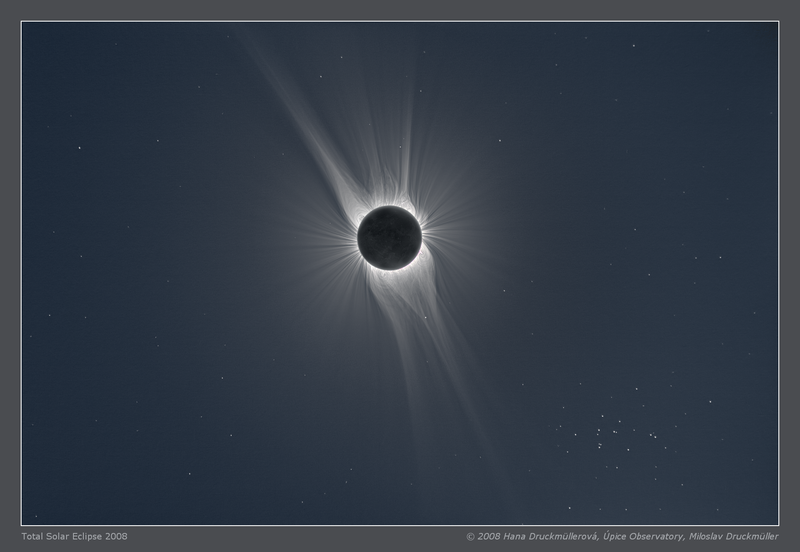 It was darker than the previous eclipse (2006) and the corona was less extensive. We could see streamers. There was a red prominance at the one o'clock position. Looking out to sea straight ahead I could see the beautiful eclipsed Sun with its corona. Just above and to the left was Mercury, close to the Sun and brighter than Sirius (the brightest star). Further left was Venus, a bright non-twinkling lamp. I noticed that the shadow was eliptical. It was darker in the East-West axis than North-South. Georgina spotted the star Arcturus behind us. Several dogs were barking. People were howling with awe, wonder and pleasure. Fireworks were being set off several kilometres away to our left. The lights of the city to our right had come on. Fortunatly both these distractions were a long way from us. If Totality had arrived quickly it was now leaving quickly as the Moon's shadow whizzed past us at nearly a kilometre per second. I just had time to look through binocculars at the Sun when I noticed the sky brightening in the North West. I looked up to see a brilliant diamond ring. The sky was lit up with golden light as Totality ended. We hugged and whooped with delight at what had been a superb eclipse. 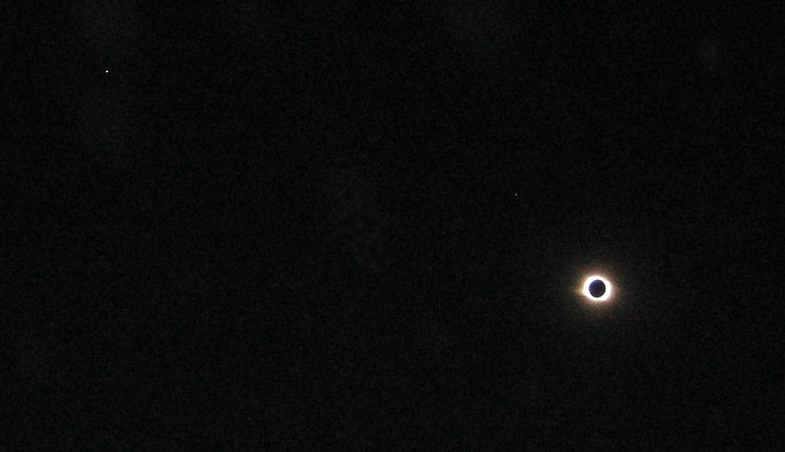 For the first time I was using a digital camera at an eclipse. I could instantly see what images I had managed to catch of this fleeting and unusual phenomenon. No photographic equipment can ever do justice to a Total Eclipse of the Sun. We had all captured different aspects of the event and had something unique to add to the experience. Talaat had been recording the event in video and audio and, unlike the rest of us, had continued to record after Totality was over. We lingered on as the partial phases slowly returned the Sun to its full brightness. Within an hour it was difficult to tell that anything had happend. It had been a great show and we had enjoyed the best seats in the house. We later leant that the Altai region further south had been clouded out as had many parts of China. We packed and left, catching the bus back to the station. The local drunk smiled at us. The train back was packed and slow. Even the sky was now cloudier. Our little group slowly split and the core of five ended up in the Zhili Bili, our restaurant of choice in Novosibirsk. I had a kebab with chips washed down with the local beer, the appropriately named Siberian Corona. By the time we headed home, the buses had stopped so we took a taxi. Our driver sang to us in Russian. He had a wonderful tenor voice but his song could not match the music of the spheres provided by the Sun and Moon a few hours earlier. Next one, China or Japan 2009. The Inner Corona with Prominences. The Totally Eclipsed Sun with Venus (left) and Mercury. 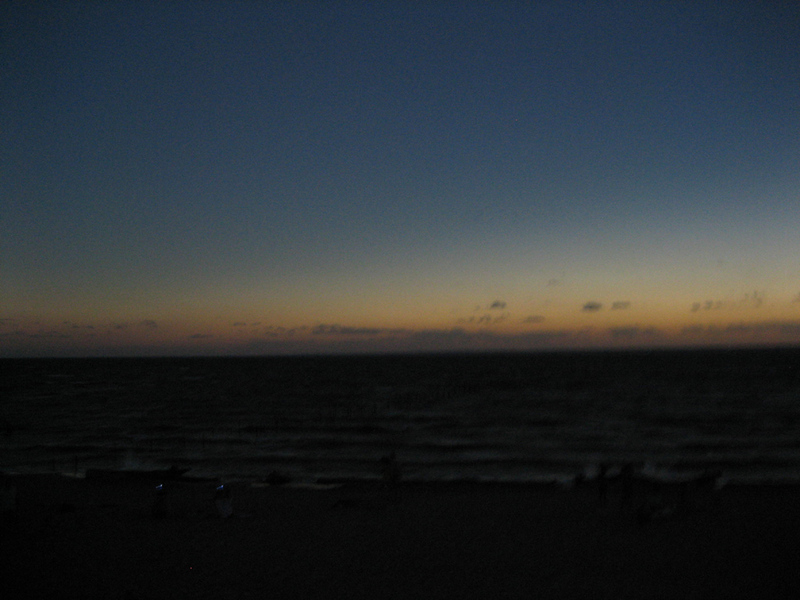 The beach at Staribirsk on the Ob Sea during Totality. Panorama during totality showing the planets and the sunset coloured sky. The partial phases of the eclipse after Totality. A frantic totality in Siberia. We left Novosibirsk on the Siberia-Turkistan Express. This time our companions were two older ladies. And one was an English teacher. The Carriage Attendant had seen the eclipse and it had terrified her. I showed her our photos and she looked after us for the rest of the journey. In fact we were treated like royalty on this train - everyone giving us fruit, sweets and food and wanting to talk about the eclipse. Even the Russian immigration guards were less interested in stamping our passports than they were in seeing our photos. As for the Kazakhs, they were so interested that they forgot to give us entry stamps until I reminded them. The trees of the first train were replaced by steppes - flat grasses with some hills and mountains in the distance. The Kazakhs wore colourful scarves and speak a Turkic language. They make nice dumplings and shashlyk (kebabs). We arrived in Almaty, a very green and pleasant city. We explored the city streets trying out food from the many food stalls - samsa, manty, kebab, plov. We visited the interesting Museum of Musical Instruments. The State Museum was excellent with a nomadic tent (yurt) as its centre piece and lots of ethnographic displays. It was hotter as we had moved south by 12 degrees - the temperature had gone up by the same amount. This was a very cosmopolitan city as we met Uzbeks, Tajiks, Kyrgyz, Turks and a gold toothed woman from Azerbaijan. Almaty is flanked to the south by the beautiful Tien Shan Mountains which beckoned us. A car took us out of the city and alongside these mountains. Horses grazed the grass and tombs were scattered on hills. We crossed a small pass and arrived at a tiny border crossing into Kyrgyzstan. The journey continued alongside the blue Chuy River which marked the border between the two countries. We entered the Shoestring Gorge with its dramatic coloured rocks - one section was banded black and white. We descended to Issyk Kol Lake, the world's second largest Alpine lake (after Titicaca). The lake is very blue and is flanked to the North by snow-capped mountains. There were many resort towns. At the Eastern end of the lake was Karakol, a pleasant and friendly low rise town. The houses were brightly painted with wooden shutters and nice gardens. The Russian Orthodox Church was carved wood with painted yellow domes and female singers with sweet voices accompanying the priest. The Central Mosque resembled a Chinese temple. Highlight of the week was the busy Animal Market where Kyrgyz traders sold sheep (including the fat tailed variety prized for the fat in their tails), cows, a few goats and the horses for which the region is famous. Kyrgyz males rode these horses Khan-like. Many of the men wear a distinctive type of white hat with black markings. The Przewalski Museum (a Russian explorer of Central Asia who has a pygmy Mongolian horse named after him) has details about the man and his many travels in the region. We took another car along the southern shore of Issyk Kol Lake. This is the undeveloped and wilder side with great rock formations coming down to the water. Beyond the lake was Kochkor, a tiny village. The wonderful thing about Kyrgyzstan is its Community Based Tourism (CBT) offices around the country. These link travellers with the local people providing services. We arrived at Kochkor without accommodation and were provided with a homestay. These well kept, clean and tidy family houses are good value and include breakfast. CBT also provided a taxi driver who took us to a 3016m high lake called Song Kol. The lake is famous for its jailoos (summer pastures) where herders bring their yurts (nomadic tents) and their livestock to graze. We saw many horses, sheep, goats, cattle and even yaks. The lake was surrounded by mountains, some snow capped. Traveling by taxi can be a good option for tourists, especially with the advent of services like Uber. Uber drivers can use their own car even it they have a TitleMax loan on their vehicle. Drivers give TitleMax the title to their car or motorcycle in exchange for a loan, and then receive the title back when the loan is fully paid. After a brief stop in the capital, Bishkek, we took a shared taxi through the Kyrgys Alatau Mountains. We entered a canyon and began to climb to a 3586m high pass and blasted through it in a Soviet built 2.4km tunnel. It was badly lit and a little scary but our driver was careful. This opened out to the wide and fertile Suusamyr Valley, another jailoo with yurts, horses, streams and trees, flanked by snow capped peaks. Another pass lead into a forested gorge where people sold honey in roadside stalls. We descended to ocre and yellow barren rocks dotted with fertile oases leading down to the Naryn River Valley. Toktogul Lake was torquise blue and surrounded by barren rocks. Even more intensely blue was the Naryn River itself as we followed it along a narrow gorge. The land flattened out into the Fergana Valley. Osh felt like Asia. It was a busy Islamic bazaar city with Kyrgyz, Uzbeks, Uguirs, Turks and others living and trading there. A four wheel drive Japanese jeep was hired for three days. This performed admirably as long as the road was paved and flat. A few kilometres out of Osh the pave disappeared and we began to climb several passes. On engaging the four wheel drive the engine over-heated. The scenery was outstanding especially as we reached Sari Tash. A long white line of snow capped mountains stood before us from horizon to horizon - and we had to climb into them. At 4000m we entered underdeveloped Tajikistan. Bribes were paid and soldiers were given lifts to. Lake Karakol was a deep blue azure colour and surrounded by snow capped mountains. This lake was formed ten million years ago from the crater left by a meteorite strike. Murghab was our first stop and we spent the night on a Kyrgyz family's living room floor. At 3800m our heads were aching. The star gazing was superb though. The next day was spent on the Pamir Plain, a desolate but beautiful plateau dotted with azure salt lakes and towered by mountains. We spent the night in a sanitorium at Jelandy. This had been built over hot sulphurous springs so the showers were delicious and there was a pool and restaurant. We followed the pretty Gunt Valley down to the Pamir's main town, Khorog, just a kilometre from the Afghanistan border. We saw the weekly Afghan Market - the Afghanis are easy to spot with their distinctive clothes. We took another car to explore the Panj and Wakhan Valleys. Both are shared with Afghanistan so villages could be seen and heard across the river. Looking across the valley we could glimpse the glaciated Hindu Kush Mountains of Pakistan just 10km away beyond a narrow strip of Afghanistan. The valley was dotted with forts, Buddhist stupas, and tombs of Sufi saints. And the scenery was outstanding as it had been all through Tajikistan. The capital, Dushanbe was a two day journey away. On the first day we followed the Panj Valley northwards alongside Afghanistan. The villages on the Afghan side were pretty with mud houses set among green oases. Gorges were navigated leading to wide fertile valleys. The second day was difficult as the road was bad but again the scenery was superb. We arrived in the capital during an international summit. All hotels were booked solid and there was nowhere to stay. A kind English-speaking Uzbek man (Bahrior) and his Tajik wife (Parveena) took us to their home, fed and watered us and gave us a floor-made bed for the night. In the morning they took us to an apartment in the centre that they had found in the newspaper. Frequent closures of the city centre meant that we did not get to see much in the city. Our journey northwards through the Fan Mountains was spoiled by road works delaying our shared taxi until nightfall. We saw an ancient city at Penjikent and crossed into Uzbekistan. Samarkand was a city with spectacular monuments scattered around it. At its centre was the Registan, a colllection of blue tiled Islamic schools built by Timor and his grandson, Ulugbek. Although we had crossed into another country, this city was still mainly Tajik speaking. One highlight was Ulugbek's 1420s Observatory, discovered in 1908. Apart from ruling Samarkand he taught mathematics and astronomy and wrote books. A Renaissance man before the Renaissance began in Europe. We had daytrips to the huge Sunday market at Urgut and to Shakhrisabz where Timor was born. We saw the ruins of his enormous palace and a mosque with a painted interior. A train took us to Bukhara past cotton fields and semi-desert. The old town was delightful and quiet. The historical buildings were part of the normal landscape. There were domed covered bazaars, mosques, Islamic schools, tombs and narrow cobbled streets. At its heart was Lyabi Hauz, a tree-shaded square set around a pool and flanked on three sides by blue tiled 15th century buildings. Some facades feature animals, unusual in Islamic art. The Kalon Minar was a 47m high minaret built in 1127 and featuring the region's first use of glazed tiles among the fancy brickwork. Legend has it that it had impressed Genghis Khan so much he ordered it spared when he sacked the city. The Tomb of Isnail Somoni dating from 905 and covered in terracotta bricks forming a maze of patterns. Some of the newer mosques (newer in Bukhara meaning later than 16th century) had tall Persian gates covered in tiles. The older ones had elaborately carved wooden columns and painted wooden ceilings. The Ark is an enormous walled citadel where the rulers of the city lived until 1920 when the Russians took over. The final Khan's Summer Palace was a riot of gaudiness while the shrine of Sufi saint, Bakhautdin, was set in a quiet garden and an ideal place to escape the tour groups. Khiva was a walled city with stunning minarets, palaces, mausoleums and medressas. Jucy watermelons were another of its highlights. At one gate there is a statue of Al-Khwarezmi. Mainly unknown to the West, he developed the Indian numeric system which came to Europe as "Arabic Numerals". His book on mathematics gave the English language the word "algebra" and from his name we get "algorithm". A 16 hour daytrip took us to Chillpyk, a Zoroastran 'tower of silence'. We crossed the Amu-Darya River on a series of barges acting as a bridge. This was the ancient Oxus when crossed by Alexander The Great. We stopped at Nukus where we saw an art gallery of banned Soviet art saved by being displayed in this backwater town. The collection is becoming internationally famous and is changing the history of European art. Our destination was Moynaq, once a large fishing port on the Aral Sea but now 150km from the water. The shrinking sea is one of the great ecological disasters of the 20th century. It was caused by the diversion of rivers to irrigate cotton fields. We stood by the 1960 shoreline and viewed the rusting remains of the fishing fleet resting on the former seabed. Elliq Qala is a region north of Khiva. The semi-desert is dotted with forts, temples, ancient cities and other excavated structures. A train took us to the friendly city of Tashkent and from there two flights (via Riga) brought us home. Written account and all text descriptions. (© 2008). All photo and video editing. Inner Corona and Prominences, Diamond Ring. Bad photos of Sun and planets. Beach. Some individual portraits. Shadow approach before Totality (four photos). Taken with Lumix FZ-18 digital camera. 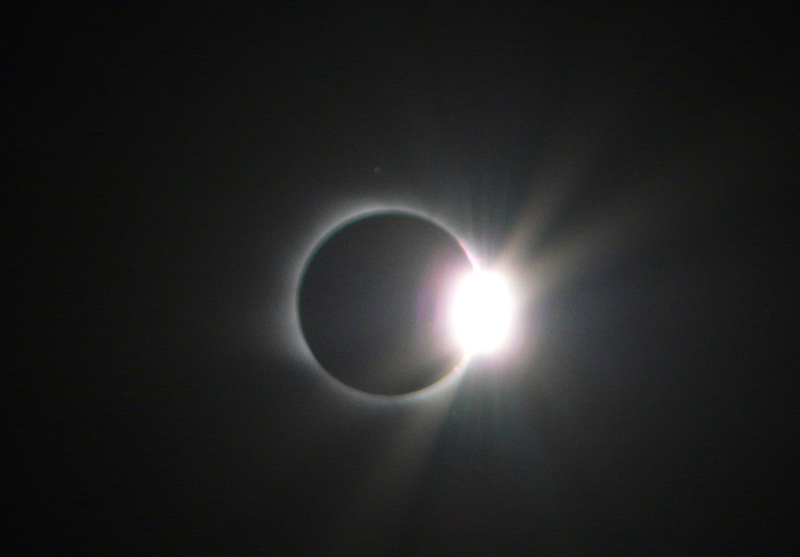 Eclipsed Sun and Diamond Ring at 1/800th of a second. Eclipsed Sun with Venus and Mercury. View of beach during Totality. Post Eclipse Group. Some individual portraits. On the train. Partial eclipse. Shadow approach at Totality (three photos). The 'stage'. Yevgeni Stepchenko: Accommodation in Novosibirsk and transfer to and from station. Real Russia (Igor): Russian visa and train tickets. The 2008 eclipse main page. Maps of the path of the 2008 eclipse from Fred Espenak and eclipse details at the observation site. People from the 2008 eclipse. The Shadow approaches from the North West over the sea. The Diamond Ring developing - taken from video stills. A partial eclipse of the Moon occurred two weeks after the solar eclipse. This was observed in the market city of Osh in Kyrgyzstan. Wonderful photos from the banks of the Ob Sea in Siberia. 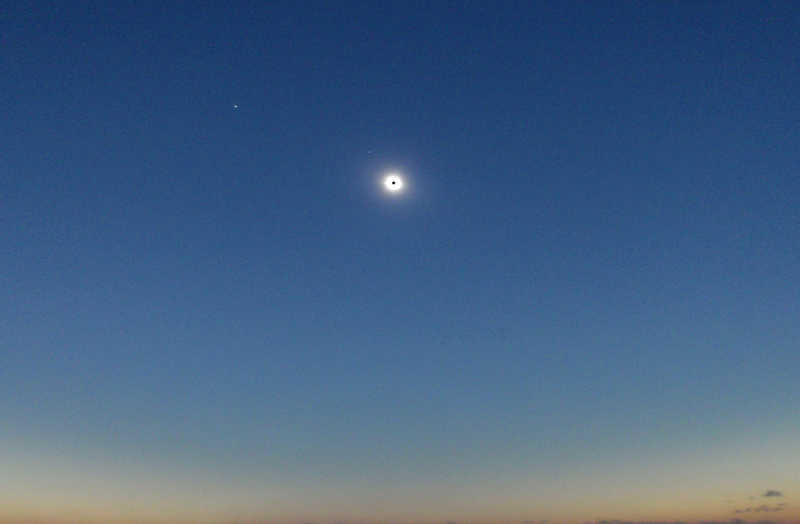 Single photo from Siberia showing the background stars at the eclipse. Siberian eclipse photos featuring an animation during totality. Video of the eclipse from Novosibirsk.